Do you want to know how to batch edit in Lightroom? Being a wedding or event photographer, you should always work with Lightroom batch processing to save time. You can apply similar settings to a number of shots, spending less time on image editing. Let me tell you about 4 easy batch edit Lightroom techniques that will make your work easier. Today many image editing programs have a function for batch photo processing. It means you can spend less time to achieve a consistent result. It means, you need to edit the first picture in a particular style and apply these settings to the rest of the images. Batch editing in Lightroom obviously works better with the collection of pictures that have common characteristics, for example, settings and lighting. It is more effective with general photo editing parameters, like overall exposure, coloring, contrast, white balance. More specific picture editing tasks (such as skin tone correction or teeth color) still need to be edited individually. Step 1. Activate importing in the Library module. Step 2. Find the “Apply During Import” module in the import section. Step 3. If you have a favorite preset, find it and select Import. Follow these easy steps and reduce the number of image editing stages. Moreover, you can use these adjustments or change the module later. What if you need to work with different images? Is it possible to perform batch editing in Lightroom? Rather than processing one shot at a time, you can select the images in the library and apply presets to them. 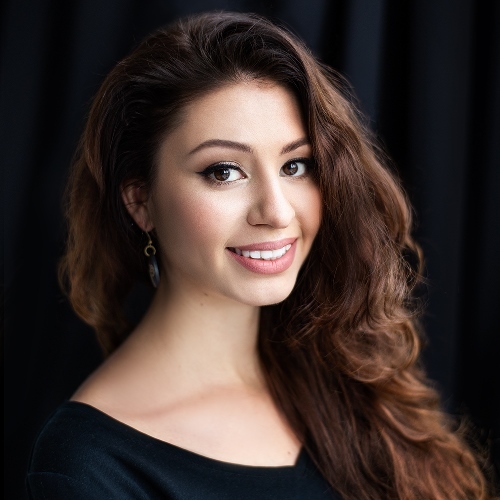 This technique saves much time for wedding photography or similar photoshoots when you change light conditions and indoor-outdoor location. So, if you are thinking of how to edit multiple photos in Lightroom, just follow these useful tricks. Step 1. Select the first picture in the group. After that select other images for applying the similar preset. Step 2. At the top of the Quick Develop panel click “Saved Preset” and select the new one. Thus, it will be applied to all selected images. Step 3. Do the process once again if necessary. The Library module works smoother so picture editing is much faster than in the Develop Module. With applying presets, you may want to make the broad adjustments to your shots. This technique helps regulate the most important settings such as white balance, exposure, brightness, etc. Moreover, it is possible to apply these filters to the set of images simultaneously, which saves time and efforts. Step 1. Select several pictures in the Library module – press CTRL and click to add to your selection. Step 2. Find the Quick Develop panel and tick the appropriate parameters like Contrast, Exposure, etc. Then apply the changes to the whole package. When you have applied the broad adjustments, you can regulate some parameters of your photos. You can try to adjust curves and gradient filter depending on your shot. It is better to make this in the Develop Module. However, you can group several images to simplify the process. Step 1. Run the Develop module. Then select a shot you want to change. Step 2. Select multiple images in the Develop filmstrip or Library grid view. Step 3. In the new window, click “Sync”. You can see this button to the left next to “Reset”. Check the settings before synchronizing. Include all the adjustments from the Develop module. Before batch processing in Lightroom, make sure that you won’t synchronize the unnecessary images. For example, you shouldn’t sync the adjustment brush. It is possible that the object will move, so this brush will change the inappropriate area of the picture. If you work as a wedding photographer and spend many hours editing (making color correction) pictures, you will discover very beneficial opportunity to process a group of shots at once while trying Lightroom batch edit. Choosing such kind of photo processing, you will make your works look stunning and consistent. Undoubtedly, your clients will adore such beautiful pictures and recommend you as a brilliant specialist. Don’t want to spend $9,99 per month for Adobe’s subscription? Read more to know 2 easy ways of how to get Lightroom for free legally. Lightroom batch editing ensures faster image processing. It’s not necessary to repeat the same actions again and again. You just need to edit the first image and the program will apply the same settings to the other shots. Forget about tiresome and monotonous work – tweak the shots fast and easy. Save your time and trust wedding photo editing to us. We will edit multiple photos at once for $0.20 per photo or $99 per wedding. We guarantee professional Lightroom batch processing. If you know how to batch edit in Lightroom, you will be able to make your shots consistent. That is really of great importance if you have to deliver many photos from one photo session, for instance, wedding shooting. It is important that the package of the shots from a particular event is edited in the same style. That ensures your professionalism. How to avoid the incongruence between pictures? Sometimes people make errors that can violate the picture processing. You can miss some details, and the final result might be disappointing - one of the pictures will differ from the rest. Moreover, you may have troubles in identifying the problematic element in order to make the adjustments. Batch editing in Lightroom is a completely automatized process that eliminates such problems. I suggest you to use any of these 10 outstanding FREE Lightroom presets without spending a single dollar. They are perfect for almost all types of photography - wedding, portrait, lifestyle, newborn, etc. No doubt, if you have an intention to speed up your picture editing workflow, you should learn how to batch edit in Lightroom with these amazing presets. Find out how to create Lightroom presets or how to use Lightroom presets if you have never used these filters for color correction. 1. FREE Lr Preset "Cloudy"
This free wedding preset offers a split tone effect. You can improve your shot adding various shades to the particular area of the photo. Make photos clear and sharp. 2. 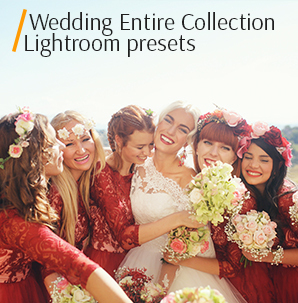 FREE Lr Preset for Weddings "Soft Skin"
This Lightroom filter affects white balance and makes wedding pictures a bit livelier and warmer. It is really important, as clients wish to have romantic and memorable shots. 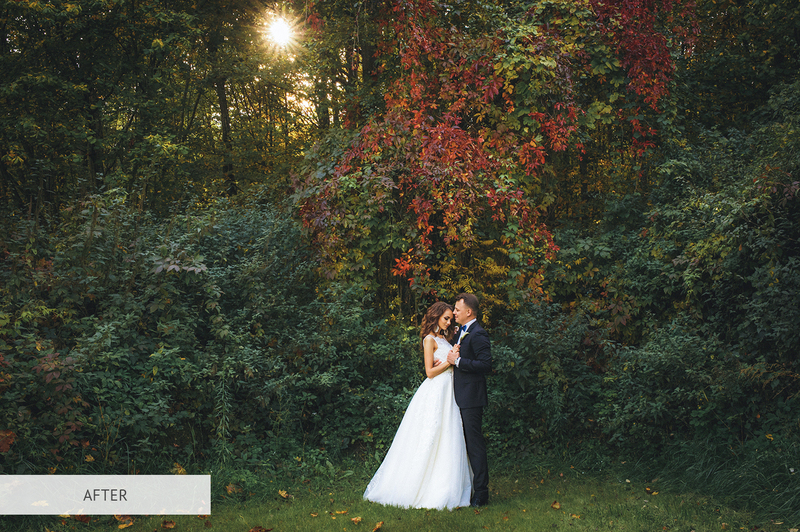 Highly recommended for outdoor wedding photographers to emphasize background and green colors. 3. FREE Lr Preset Pastel "Cinematic Look"
There is hardly a photographer who hasn’t tried this preset. This plug-in is great for any kind of photoshoots and is used according to the photographer's idea. No matter what light was used during the photo session, this filter will create a warm pastel atmosphere. 4. FREE Lr Preset "Sunny Weather"
The photos become brighter and livelier if you apply this plug-in. Natural tints and pleasant light will beautify any shot especially the one taken indoors. 5. FREE Lr Preset Fashion "Glamour Yellow"
This preset is good for portraits. Glamour yellow tint gives a vintage effect filling the picture with brightness and preserving the natural tone of the skin. 6. 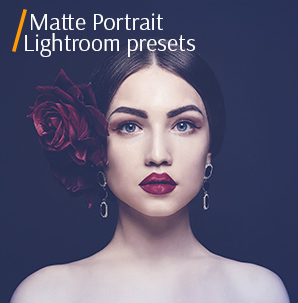 FREE Lr Preset Fashion "Soft Matte"
Fashion photography editing is a very delicate process. To make it more enjoyable, apply this preset and you’ll get brighter colors, while keeping the skin tone natural. 7. FREE Lr Preset "Cool Light"
Use this free plug-in to make cold colors more prominent. Enhance the pictures of nature regulating the contrast and temperature. You will certainly be impressed with the result. A perfect preset for travel photographers. 8. 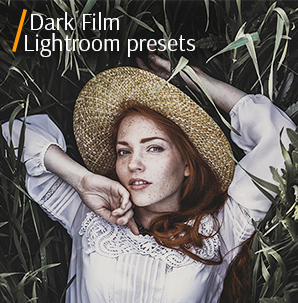 FREE Lr Preset Sunrise "Dark Matte"
This preset accentuates dark green and yellow colors. It is excellent filter to enhance beach and landscape photos. However, “Dark Matte” is not good for portrait photography, because it adds a greenish and unnatural look to the skin. 9. FREE Lr Preset "Fresh Look"
This great filter regulates the contrast, corrects white balance, improves clarity and alters cool tints. It removes details in the shadows while remaining very delicate and subtle. It is better to use it for outdoor photography with lots of greenery. 10. FREE Lr Preset Glow "Pure"
This Fuji preset regulates blue color, clarity and emphasizes the details. I would recommend using it for portrait images, especially for the photos with lots of green objects and water. Trying to learn how to batch process in Lightroom, you’ve probably understood all the strong points of this technique. Now, you can spend less time and still get impressive results.